A digital system called eHospital, which allows patients’ notes to be seen in real time on any computer, has affected how every member of the nursing team works at Cambridge University Hospitals NHS Foundation Trust. The system, introduced just over three years ago using an IT system called Epic, meant a phenomenal change, and it was a steep learning curve, she says. The project, which will cost £200 million over ten years, was initially beset with difficulties that were part of the reason for the trust being briefly put into special measures. After overcoming those teething troubles, the trust is now a member of NHS England’s global digital exemplar programme. This is a group of hospitals and mental health trusts that are improving care by leading and developing new IT solutions (see box). When paper has to be used, such as for signed consent forms, they are then scanned into the patient’s digital health record. 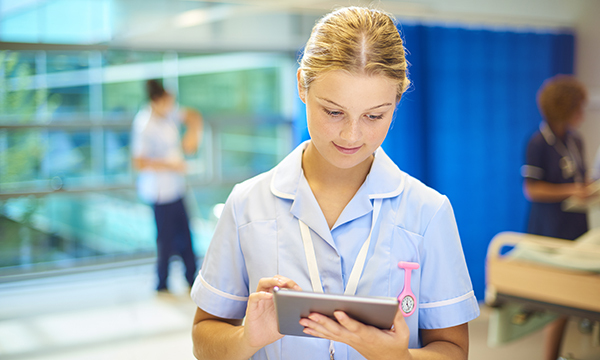 The digital health records used at Addenbrooke’s Hospital in Cambridge give nurses and other clinicians quicker access to more comprehensive patient information. Test results, assessments, patient observations, prescriptions, care plans and discharge planning forms are all put directly into the patient’s health record and can be viewed simultaneously by different people anywhere in the trust. The system is continuously developed. Recent changes include barcode scanning for medications, and every patient wearing a barcode wristband. It is used in different ways in different departments, she says, and has helped run virtual fracture clinics, improved bed management and speeded up sending letters to GPs. The system will recommend care plans to a nurse admitting a patient, and has helped standardise care by allowing nursing managers to see quickly if patients have had the necessary assessments. In the emergency department, a sepsis alert feature on the IT system has seen an 80% increase in the number of patients receiving antibiotics within the critical first 90 minutes. Specialist nurses in clinics can be kept updated on what is happening on wards, see the same information as if they were on the ward, and make advanced assessments, decisions and recommendations for patients. ‘This is particularly useful for rapid response teams when they need to prioritise who to see first,’ Ms Balsdon says. The need for the NHS to be fully digitised has been recognised by the government. Five Year Forward View and Personalised health and care 2020 discuss the need for digital transformation across the health and care system to ensure it remains sustainable and provides high quality care. This includes the goal for the NHS to be paper-free at the point of care by 2020. In Cambridge, becoming fully digital was far from straightforward. Around 11,000 staff had to be trained in the Epic system before it went live in October 2014. Reports in the media said staff were struggling with the transition, and a year later the Care Quality Commission expressed concern that the Epic system had ‘affected the trust’s ability to report, highlight and take action on data collected’. NHS oversight body Monitor, now part of NHS Improvement, also mentioned Epic as one of the problems when it put the hospital into special measures in late 2015. Addenbrooke’s had underestimated the scale and challenges of implementing eHospital, Monitor said. But by January last year the trust was rated good by inspectors, who were satisfied that many of the IT concerns had been addressed. ‘Staff were more familiar with the system, though care planning was not always individualised and personalised,’ they said in a report. For nurses’ managing teams it is now easy to gather information for audits, and to see how many patients are being given a falls risk assessment, for example. Before the digital system, a paper audit was time consuming and the data produced may have been six weeks out of date. Barcodes on medications must be scanned before they can be administered. In some wards patients’ barcoded wristbands must also be scanned as part of the medication round to confirm the patient is receiving the correct medication and the right dose at the right time. Medication errors have been reduced by 50%, the trust says. Some patients can also access their own records through an app that gives them more control over their healthcare. The programme provides a list each day of what needs to be done, such as observations and medications, and at what time for each patient. Care plans are also part of the system now, so it is easy to check that every patient has one. Having different users able to access records simultaneously is a huge benefit, and prevents records going missing when sent to different areas, such as the pharmacy, she says. The global digital exemplar programme was announced in 2016, covering 16 acute trusts and seven mental health trusts. These, along with four more acute trusts announced last March, were chosen because they were already using world-class technology and providing good standards of care. Through funding and international partnerships, these trusts are expected to be in the vanguard of digital improvements over the next three years and share their learning and experiences with other NHS organisations. Last September health secretary Jeremy Hunt announced the ‘fast followers’ who will be partnered with exemplars to support the spread of best practice. The 18 acute trusts will share up to a total of £80 million over the next three years, and mental health fast followers are expected soon. Plans include digitising patient records and test results, new ways of engaging the public and better recognition of deterioration in patients. Investment will ensure people have equity of access, says a nurse researcher.